Flowscape’s CEO at Småbolagsdagen: "The user experience guides everything we do!" 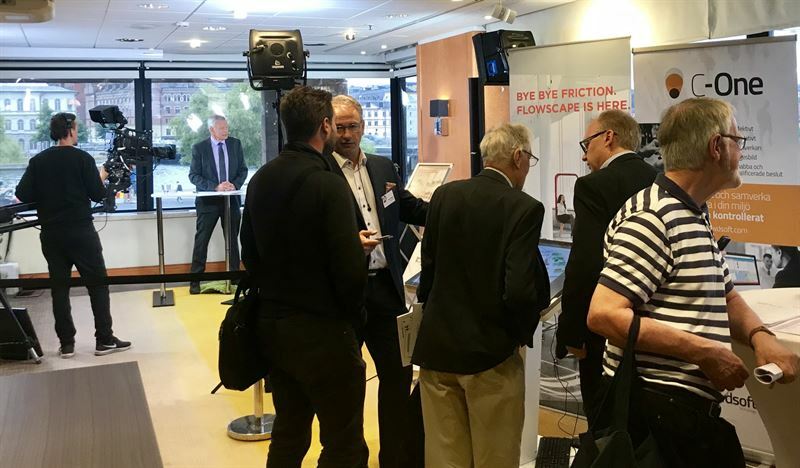 For the sixth year in a row, Småbolagsdagen was arranged on June 11th at Sheraton in Stockholm. Flowscape/Crowdsoft was there to demonstrate the value of the frictionless office and the intelligent communication solution C-One. The day started with CEO Peter Reigo giving a presentation of the company, its strategy and future plans, ending with questions from the moderator and audience. Peter talked among other things about how the newly signed partner agreement with Ericsson will help to scale up Flowscape/Crowdsoft’s presence in the global market. Replying to a question on how Flowscape/Crowdsoft differs from its competitors, Peter mentioned Flowscape’s strong focus on a comprehensive solution where the client company’s employee experience always guides both product development and sales. See the film where Peter Reigo presents Flowscape/Crowdsoft and answers questions here.